The body of a 12-year-old Canadian girl was found Wednesday in San Vicente Reservoir, five days after she fell from a boat, authorities said. Rescue crews used sonar, autonomous underwater and remotely operated robots as well as rescue divers to bring the girl’s body up. Data from the robots located the possible location of the girl Tuesday evening and rescuers were able to confirm Wednesday morning using a remotely operated robot with a video camera. The girl was found at the bottom, but she was not stuck, Gartland said. The girl was in the bow of a ski boat that was towing people on a tube when they fell into the water around 6 p.m. Saturday. 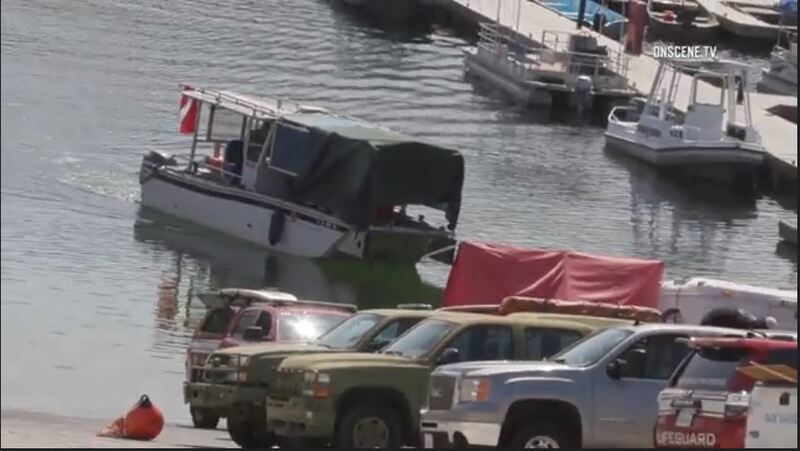 The boat slowed down and the girl, who was visiting from Canada with several members of her family, went over the side and into the water in front of the boat, according to San Diego police. Investigators believe the vessel continued to move, possibly running her over. She was wearing a life jacket, which rescuers later found in the water. Several agencies had searched since Saturday to recover the body of the youngster, using sonar and other devices. The rescue operation was especially challenging because of the depth of the reservoir. Past 120 feet and the water become murky. There are also trees and debris the prevented divers from going deeper. “This is was absolutely a technologically heavy search and we were able to — thank goodness — bring it together for the family and bring this person home,” lifeguard Lt. Rich Stropky said. The girl’s name was not immediately released. Updated at 5:20 p.m. Aug. 15, 2018.